Fraxinus americana. By Glen Mittelhauser. Copyright © 2017 Glen Mittelhauser.New England Wild Flower Society.gobotany.newenglandwild.org (Accessed 1/2017). Fraxinus americana is a tree to 40 m tall; taprooted, roots associated with VA mycorrhizal fungi such as Gyrodon merulioides (syn. Gyrodon m., Boletinus porosus; shallow pore/ ash-tree bolete,) (Bills et al. 1986; Lincoff, 1981; Brundrett and Kendrick 1988);); bark dark gray, mature trees with reticulate ridges and grooves, twigs usually hairless; top of leaf scar “U” shaped, terminal bud blunt, wider than high; growth pattern determinate (Marks 1973). 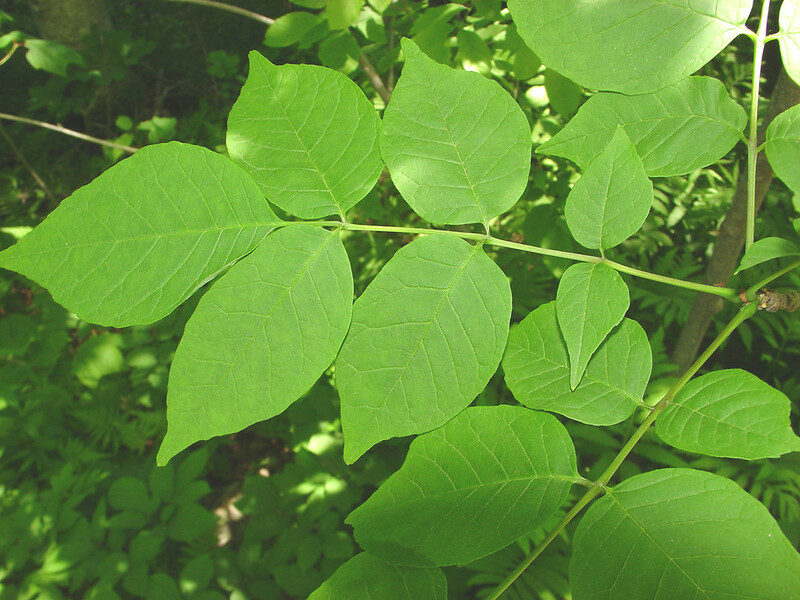 Leaves opposite leaflet stalk wingless, blade pinnately compound, leaflets 5-9, usually 7, oblong to egg-shaped, tip pointed, vaguely toothed, lower surface with tiny bumps (papillose) and paler below. Flowers small, sexes on separate plants (dioecious), April-May, wind pollinated (to 100 m). 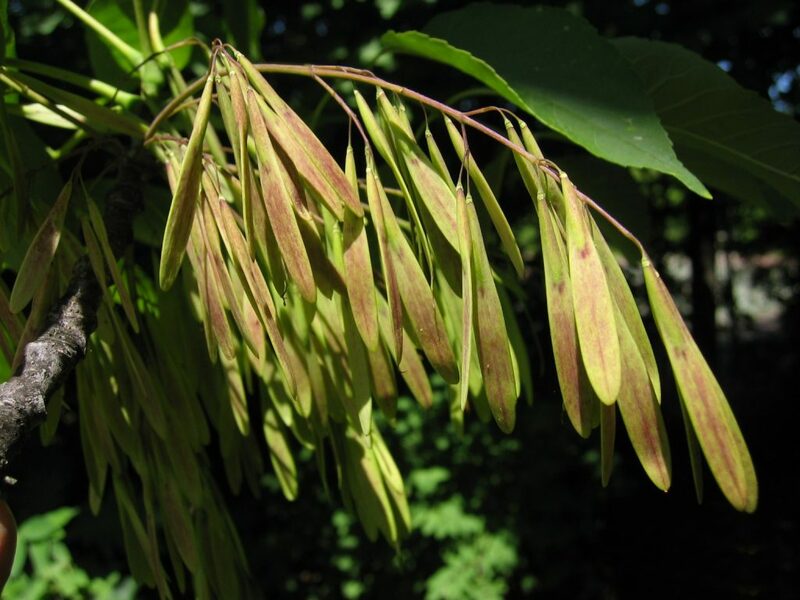 Fraxinus americana seeds.commons.wikimedia.org (Accessed 1/2017). Fruit dry, winged, narrow, 3-5 cm long, wing about 0.5 cm wide (Harlow 1946), extending 1/3 way down body, free part of wing, above body, longer than seed, Oct.-Nov.; wind dispersed, Nov.-Dec. Requires overwintering before germination. Seeds eaten by numerous birds and small mammals, including white-footed mice (Peromyscus leucopus) (Ostfeld et al. 1997; Martin et al. 1951). Habitat: Pioneer in moist, fertile soil. Grows well on limestone derived soils relatively high in calcium, magnesium, silt and clay (Balter and Loeb 1983). Tolerates soil pH 4.7-7.5 (Burns & Honkala 1990; USDA, NRCS 2010). Moderately shade tolerant, index 6-8. Moderately tolerant of salt, drought, flooding, soil compaction. Intolerant of ozone and air pollution. Seedlings need ca 50% sunlight but saplings can persist under closed canopy, young trees grow rapidly in high light (Whitney and Runkle 1981; Hightshoe 1988). Fraxinus americana.bark.www.The Sanguine Root.thesanguineroot.com (Accessed 1/2017). Fraxinus Americanus.emerald ash borer.Agrilus planipennis.Photo courtesy of Eric R. Day, Virginia Polytechnic Institute and State University, Bugwood.org.arinvasives.org (Accessed 1/2017). Notes: Bark eaten by rabbits, seedlings eaten by meadow voles (Microtus pennsylvanicus) (Martin et al. 1951; Ostfeld et al. 1997). Young tree stump sprout if cut. Older trees intolerant of shade, strong apical dominance, shaded branches die off. Growth rate 3.44 (relative to 9.24 for B. populifolia and 0.99 for sugar maple). Growth rate was found to correlate well with relative shade tolerance (Grime 1965). Ash yellows is a fairly recently recognized disease probably caused by mycoplasma-like organisms. Major symptoms include development of numerous small twigs from the base of the tree (witches broom) that produce dwarfed leaves which are often yellowish between veins (Pokorny and Sinclair 2001). 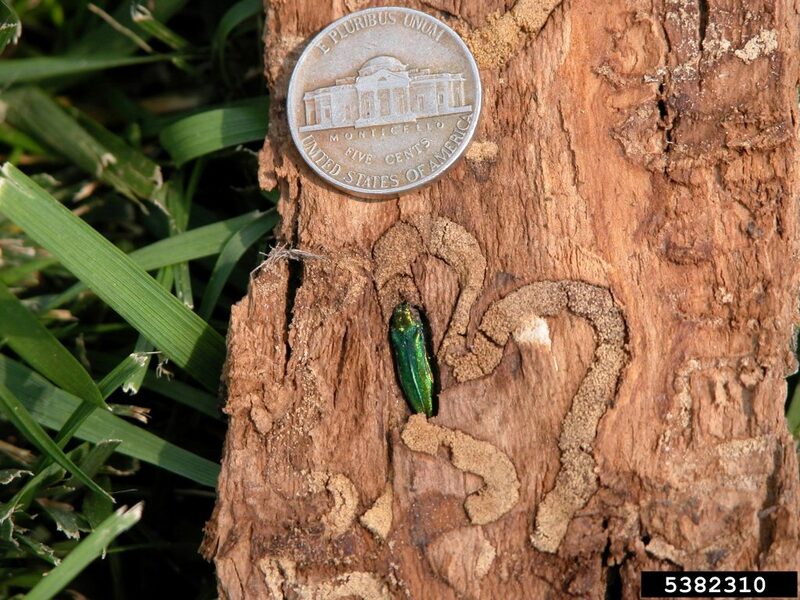 The emerald ash borer (Agrilus planipennis) has become a major cause of death. Affected by ash decline (dieback), from multiple causes: drought, freeze damage, fungi, viruses and mycoplasma-like organisms, which are also implicated in ash yellows. 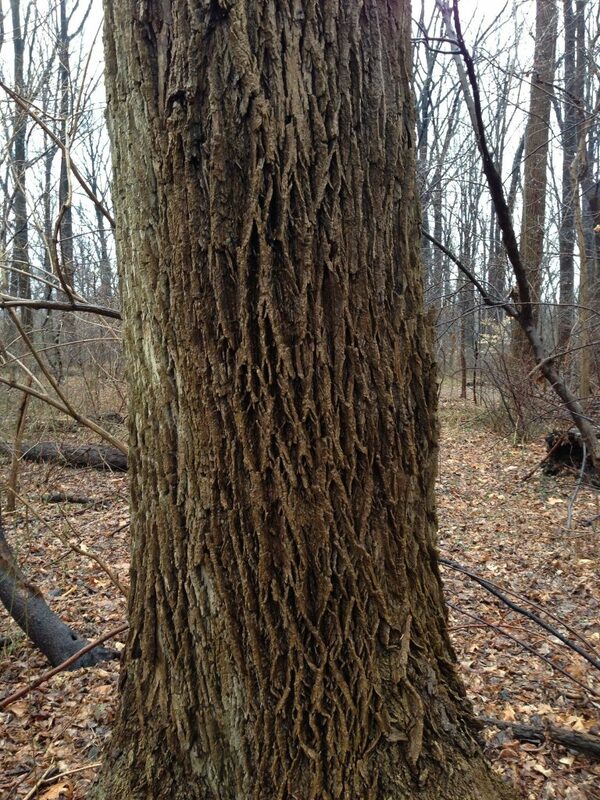 A host tree of the Asian longhorn beetle, Anoplophora glabripennis (see Norway maple). The nematode Meloidogyne ovalis associated with root injury, nematodes may carry ringspot virus. Some trees killed by oystershell scale (Lepidosaphes ulmi). Other pests include various Lepidoptera larvae and ash bark beetle (Burns & Honkala 1990; Sinclair et al. 1987).